The referendum, declared illegal by Spain's central government, has thrown the country into its worst constitutional crisis in decades. Barcelona: Tens of thousands of Catalans are expected to defy Spanish authorities and attempt to vote in a banned independence referendum on Sunday, raising fears of unrest in the wealthy northeastern region. In a sign of how the planned vote has polarised the country, thousands of pro-unity demonstrators gathered in Spain's major cities, including Barcelona, to express their fierce opposition to Catalonia's attempt to break away. In the region itself, hundreds of supporters of the referendum spent the day with their children playing football, board games and ping pong in schools, traditionally used as voting stations in Spain, to keep them open until voting starts at 9 am (0700 GMT) on Sunday. The government said just a small percentage of schools were occupied, however, and that it had verified that most of the more than 2,300 earmarked for the vote were closed. In those where they gathered, parents brought sleeping bags and prepared to bed down on gym mats. "We don't understand why we can't express in a peaceful manner the simplest expression of democracy - a vote," said Pablo Larranaga, as he stood in a school in Barcelona surrounded by parents and small children. "We don't know what is going to happen tomorrow. We are going to try to vote in the only way we know, which is peacefully." It is still unclear whether the referendum will go ahead despite the regional government's assertions that it will proceed and Madrid's insistence that it will block the move. Police monitored schools earmarked as polling stations and occupied the Catalan government's communications hub on Saturday in an effort to prevent the referendum from going ahead. The Catalan police, or Mossos d'Esquadra, who are monitoring the schools, are held in great affection by the Catalan people, especially after Islamist attacks in the region in August that killed 16. But thousands of extra police have been sent to the region in order to enforce a court order banning the referendum, many of whom are billeted in two ships in the port. 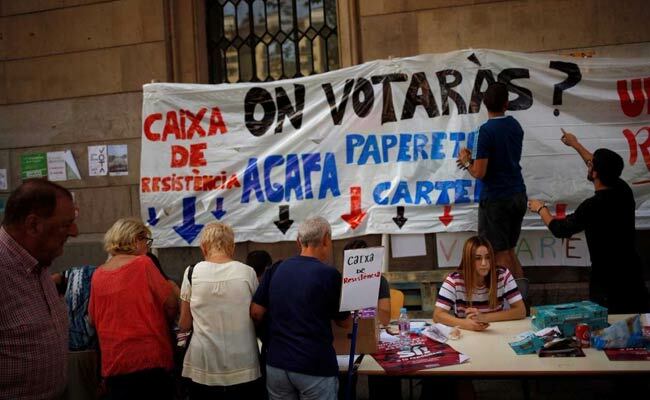 A Spanish government source said it would be up to police how they carried out orders to remove people from polling stations on Sunday. The head of the Catalan police on Friday urged officers to avoid the use of force. Organisers urged voters to arrive at 5 am (0300 GMT) at polling stations and to wait in line until the schools opened. Voters must show peaceful resistance to police action, organisers said. "We must be sure there are lots of people present of all ages," they said in instructions disseminated on social media. Any volunteer staffing a voting station with use of a census listing eligible voters would be liable for a fine of up to 300,000 euros, the government source said. Thousands of pro-unity demonstrators waving Spanish flags filled the central square outside the seat of the regional government and Barcelona city hall. One man burnt the Catalan flag while a group tried to tear down a banner reading 'More democracy' hanging from the front of the town hall to cheers from the crowd. In the capital Madrid, hundreds gathered waving the national flag and chanting 'Spanish unity' and 'Don't fool us - Catalonia is Spain'. Many balconies in the capital are draped with the red and yellow Spanish flag.